Zero Marlborough is a highly desired address in Back Bay. 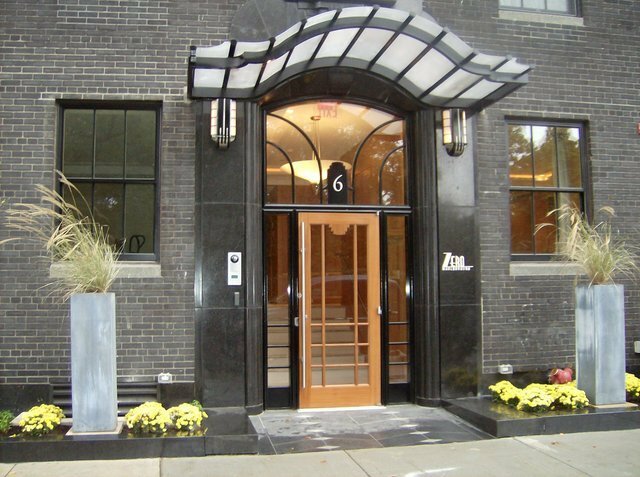 Centrally located across from the Public Garden, residents are able to enjoy a quiet and relaxing setting while being within walking distance to the bustling Newbury and Boylston streets. The building, formerly the Katharine Gibbs School, was completely renovated and transformed into Manhattan-style luxury condos with a French-style garden in 2008. The units were developed by Sea-Dar Real Estate and designed by highly rated architectural firm, Grassi Design Group. In 2009, the building won the Preservation Award. The 13 one-floor residences range from 2 to 4 bedroom homes that range from 1,300 to 4,680 square feet. There are five unique floor plans, including a penthouse, within the building to cater to different needs. Since each floor is a separate unit, residents enjoy direct elevator access. Luxury living is exemplified in the kitchen where are limestone countertops, five-burner gas cooktops, and SubZero refrigerators. The wall of windows framing the home allow residents to better enjoy the beautiful views of the Public Garden, and if they are on the upper floors of the building, the Back Bay skyline. Other services available include a fully equipped fitness center, 24-hour concierge, doorman, valet parking, and on-site professional management. The few units at Zero Marlborough rarely go on the market, so you must seize the opportunity immediately.